For every piece of original content produced on Vine, there are an endless number of remixes and iterations on that content. At its core, it’s about as important as when a six-second loop goes viral — it turns a loose group of content creators into an interconnected community. A new update today, available for both iOS and Android, finally codifies some of that remixing by allowing users to lift audio from an existing Vine loop to put into a new one. This does two things: first, it makes remixing much faster and seamless for even a Vine beginner; second, it allows for more accurate attribution and links to the original source material. Remixes can be made by tapping the ‘…’ icon in a Vine and selecting ‘Make an audio remix.’ Remixers will also get a helpful audio progress bar so they can sync up with the music. 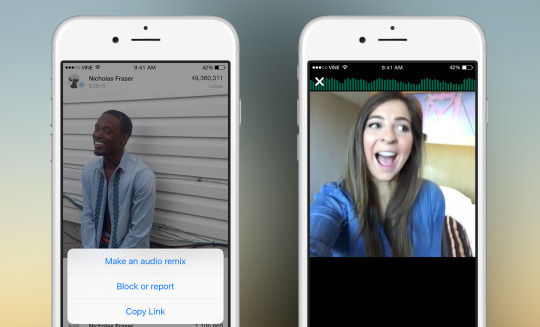 Additionally, Vine is already putting this feature to work with a new search feature that allows users to find Vines with the same audio source, whether it be another Vine’s audio or the same song. That’s an extension of the Music on Vine initiative, which is designed to give artists proper credit for their songs when used on the platform.